I really love having and using colors that match in all aspects of the party’s theme. With the signature color Tiffany blue I did a candy bar with the closest shades of blue I could find. It looked so nice to have the monochromatic shades of blue so it wasn’t so matchy-matchy. I also used white hydrangeas, popcorn in coordinating paper boxes and white rock candy to add some contrast and brighten it up a bit. The favors were inspired by the movie “Breakfast at Tiffany’s” and I added so retro sunglasses, a pearl necklace and a Bling It Candle from the silver series. I uses old Tiffany’s bags from my stash, but the party store had almost identical teal bags without the Tiffany’s logo. When it comes to party favors, I like to send my guests home with something they’ll use and love. These candles are one of my favorite gift ideas because it’s two gifts in one. A candle to burn and enjoy, plus the jewelry inside the candle. Everyone loved the whole Tiffany’s theme and the different candles, (the Bora Bora scent was definitely one of our favorites). It’s fun to share a fun night and some of my favorite things with my friends. Stay tuned to see what piece I get from burning my Bling It Candle. 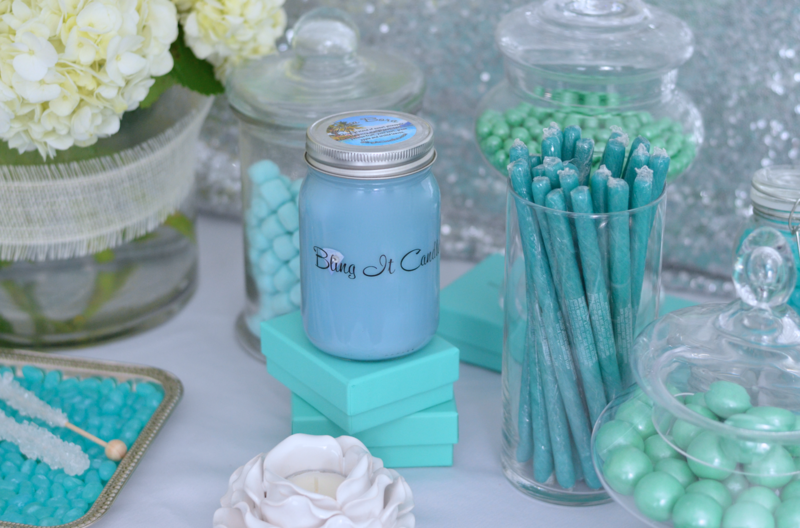 ALL June long Bling It Candles will be hosting a Tiffany & Co. Party! They will be giving away 3 iconic Tiffany’s pieces in 3 of their Bling It Candles! Every candle order gives you a chance to win that blue box and a signature Tiffany’s necklace. EVERY candle comes with a Bling Surprise but those 3 will be extra special. Two prizes be hiding in their SILVER SERIES Bling It Candle line and one will be hiding in our regular Bling It Candle line. Pairing our 100% Soy Candles with 100% Genuine Tiffany & Co. pieces is the ultimate candle. Get your orders in now for your chance to win! In honor of our Tiffany & Co. celebration month they ALSO have special candle packages that come with FREE candles! Which means more chances to win! Also, to earn yourself some Bling It Cash, fill out from the link HERE and within 24 hours you will receive your referral code. This code is valid for the entire month of June so get sharing! When your friends and family use your code, they will get 10% off their order and you will earn $5 in Bling It Candles Cash that you can use for your own purchases! Promotion goes until June 30th. On July 1st you will receive an email with your total BIC Ca$h earned and a new code with your Cash attached. Then use it to go shopping! This party was sponsored by Bling It Candles. All opinions are 100% my own.